I don't think you actually can. It's all for fun anyway. Don't take it personal. Remember, people have issues. Can you check who gave you the bad Karma? Nope, you can't. It's anonymous, and I think it should stay that way. If not, there would be a lot of chaos. PS: I LOVE your avatar, babbs!!! Now one more thing. How do you get pictures on the descriptions? Admiral Zhao: I never knew you were skilled in broadsword fighting, Prince Zuko. Prince Zuko: I’m not, they’re antiques. 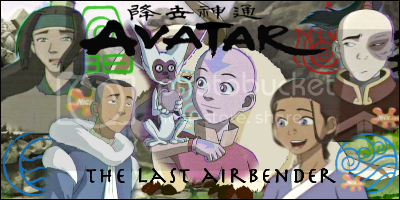 Waterbenders: the nations natural fire extinguisher. ohhhhhhh, that makes a lot more sense. I so totally get it now! Thanks, lol. but there isn't any karma going on right now is there? Why is this topic still here? It is horirbly out of date. Also, I know I already posted that here. I am a sufferer of TLWS! ^Look at the thread that's called New Ranks. It's the very first page.